Have dry and dull hair but can’t seem to find a product to help? We have the perfect solution for you! What you need is one of the best argan oil shampoos, and we’ve got them all right here. 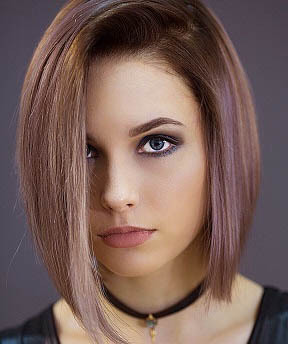 If you want healthy, shiny hair that will look like you just stepped out of the salon, then keep on reading because we have everything you need! Now that you’ve had the chance to take a quick overview of each of the best argan oil shampoos, you’re probably interested in learning more about some of them. Keep scrolling, to find in-depth, detailed reviews about each one! Looking for a sulfate free conditioner and shampoo set? Look no further than the Art Naturals Argan Oil combo. The company works to always produce reliable, high-end products, with the consumer and global health in mind. They believe that beauty products should be made with only the most natural ingredients, and due to this, their products are always BPA-free, cruelty-free, and eco-friendly. The shampoo and conditioner are amazing on their own, but if you’re looking to get everything all in one package, then you’ll love this selection! However, it’s also amazing if you need to restore your hair’s natural health. Oftentimes, if hair is dry or dull, it could be due to heat damage, being colored, or for some other reason. The couple is excellent at moisturizing, strengthening, and protecting the hair from further damage, as well. This is largely due to the Argan Oil content, in addition to many other effective ingredients. What else does the formula feature? It has a smooth blend of natural herbal extracts (aloe vera, white willow bark, burdock root, rosemary, and thyme), proteins, and Vitamin E. While all of these ingredients are important in cleansing and strenghtening, Vitamin E actually works to stimulate capillaries, which in turn helps promote the strong, healthy growth of hair. Let’s get back to the Argan Oil. It works to boost the health and appearance of your hair, including the length, color, and texture. If you have fragile or frizzy hair, you’ll love how it works to smooth the shaft and help prevent further breakage and/or split ends. No need to worry about if the set will work for your hair type, or not. It works with all hair types! However, if you do have dryer, more brittle hair, you’ll probably see more drastic results, although it won’t hurt your hair regardless. If you’re searching for a budget argan oil shampoo, there are a ton to choose from. However, few are on the same level of quality that the Maple Holistics Argan Oil Shampoo is. 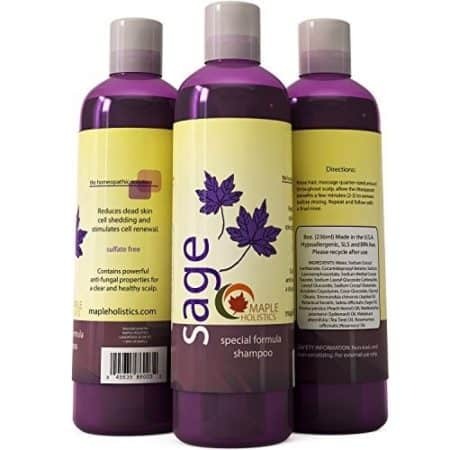 Maple Holistics is a US-based company which focuses on an array of beauty and hair products. All of their products are designed to be healthy for the globe, and for its consumers. Despite all of that, all of their products are cruelty-free. The argan oil shampoo is created to replenish dry, damaged hair with vitamins to strengthen the hair shaft and make it look “new” again. It’s specially designed to hydrate hair, and infuse it with a variety of ingredients like: argan oil, Almond Oil, Jojoba Oil, Botanical Keratin, Peach Kernal Oil, and Camellia Seed Oil. Not only that, but it also works to retain moisture, once you have it. Why were these ingredients included? Because they’re chock full of an array of vitamins which will make your hair healthy again, from the inside, out. If you want silky, flowy hair, then this is the one for you. It doesn’t matter your hair type, either: straight, wavy, or curly – it works well with them all. Many of us try to fight against our natural hair type or texture by using flat irons, blow dryers, not to mention chemical straightening. While they definitely work to some extent, they will usually leave your hair more damaged than ever before. The thing that’s great about this sulfate-free shampoo, is that it gives you real results without any of the damage. The shampoo is paraben-free and cruelty-free, so you can feel good about the product you’re putting on your hair. So, was there anything we weren’t completely satisfied with? Actually, yes, but it wasn’t something that was serious enough to sway us from choosing it as one of our favorites. The shampoo has a very thin, watery consistency, so we did have some trouble keeping it in our hands and not wasting extra product. Aside from that, we really enjoyed it! When brittle hair needs a burst of life, OGX Argan Oil Shampoo is the refreshment they thirst for. 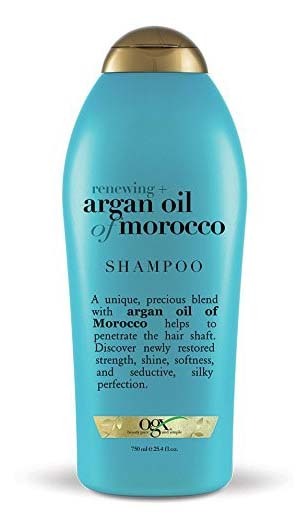 Packed with pure Moroccan argan oil, the shampoo leaves hair shiny, healthy, strong, and protected from potentially harmful UV rays, and other potential threats. Another excellent choice, if you’re looking for a budget product, this is extremely affordable – especially considering how long it will last you. The packaging, like their other shampoos, is quite attractive. It comes in a light blue bottle with a golden flip-top lid. It’s easy to travel with and doesn’t easily spill or pop open like so many others do. How does the shampoo feel? The actual product is pretty thick, and won’t cause a mess. It’s easy to portion out, and creates a luxurious foam without being over-the-top. It spreads easily, and only a tiny bit is needed to clean the full head of hair. If you read just about any OGX shampoo reviews, you’ll find that they’re overwhelmingly positive. That’s probably due to the fact that they do a great job of giving their products a natural, light scent that lingers just the right amount of time. If you want to control your frizz, this shampoo does a great job of that. 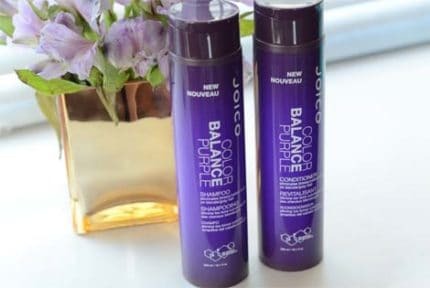 It’s not as strong as some others, but does work to give volume, while adding shine and smoothness to locks. We loved it, mainly because it wasn’t exactly easy finding a shampoo that could give shine and smoothness without weighing hair down or making it look oily. On top of all of that, it’s also sulfate-free, so it’s safe for consistent use! So, was there anything we weren’t fans of? Really the only thing would be that it’s not quite strong as some other shampoos, if you have really out-of-control hair. Baebody Moroccan Argan Oil Shampoo is a wonderful blend of 100% pure Moroccan argan oil, avocando oil, camelia seed oil, botanical keratin, almond, and coconut oil. That may sound like a mouthful, but they all have their own functions. They work together to make sure to restore shine and softness, while strengthening the strands and protecting them from free radicals. Love to style your hair? If you find yourself using heat to style your hair, or are in the sun a lot, then you’ll love how this shampoo protects against it. By using Vitamin E and a variation of antioxidants, the shampoo works over time to repair the cell structure of the strands, which works to strengthen the hair, restore softness, calm frizziness, and prevent breakage. 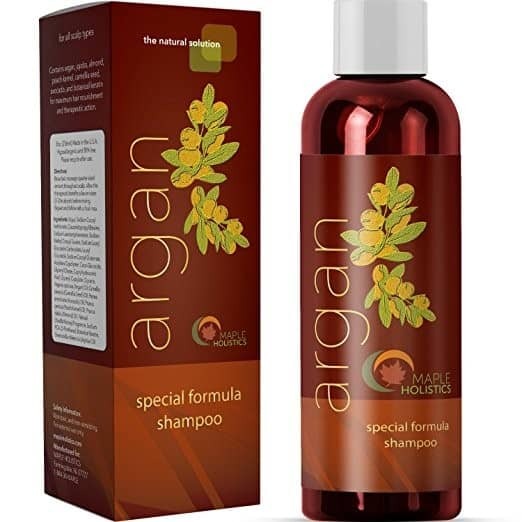 An issue we ran into frequently with argan oil shampoos, was that they tended to weigh the hair down, and at times, even make our hair greasy. What many people desire, is volume, while still having reparation benefits, smoothness, and shine. 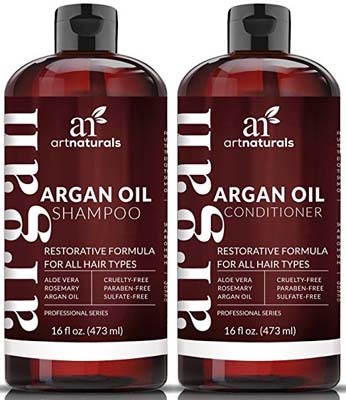 This argan oil shampoo on Amazon does exactly that. It’s gentle enough for daily use, while being safe for just about any hair type. It doesn’t leave any kind of greasiness, residue, or build-up, and it leaves the hair feeling clean, yet healthy (not stripped of natural oils). We love that it’s sulfate-free and paraben-free, too! That the consistency is very watery. This can make things messy, and makes it easy to waste product. 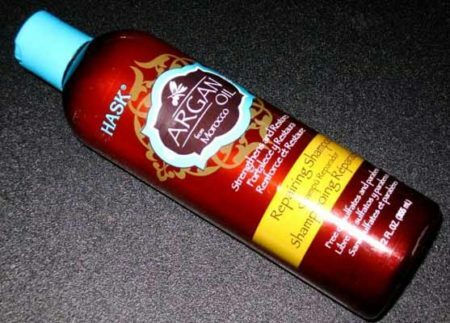 Hask Argan Oil Shampoo is one of the best on the market today – especially if you have oily hair! From the tall, slim packaging to the actual shampoo, everything is high-quality and made to work well. Those with oily hair know how frustrating it can be. You try various types of shampoos, thinking this one will finally be the one to work so you don’t have to keep washing your hair all the time. Only to end up with greasy hair just a few hours later. Fortunately, this one cleans hair thoroughly, removing grime, build-up, and any impurities, while regulating natural oil production! Thanks to argan oil and glycerin, the hair is kept soft and silky, while still retaining a level of volume, and cleanliness. It smells wonderful. Actually, this is probably the best-smelling one that we’ve tried. It smells like a kind of citrusy, natural scent. Kind of like a summer day infused with argan oil. It’s not overwhelming, and while it does give the hair the scent, it isn’t very strong. That it does contain some harsh ingredients, as well. The cleansing agent, particularly, is pretty strong. However, the rest of the ingredients in the formula seem to kind of counteract the severity, and honestly, we were left with silky, healthy, clean locks. Now that you’ve had the chance to read through each of the best argan oil shampoos thoroughly, you may have already picked out the best one for you. However, if you haven’t, that’s okay! That’s why we’ve gone ahead and written up this buying guide – to make sure you’re picking out the perfect one for you and your hair’s needs! 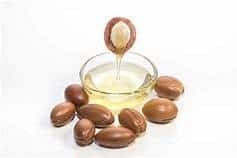 While argan oil is known to give certain benefits to the hair, such as smoothing, strengthening, and softening the strands, each formula is different. Some are made to cleanse the hair, which is great for those with greasy hair. While others are made for dry hair and scalps, and are made more for those who need added moisture in their hair. With many, they have damaged or brittle hair, and need that extra boost of strength, too. 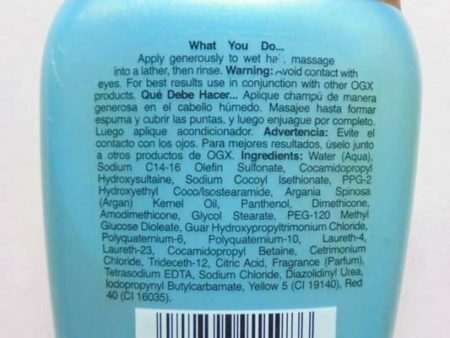 So, make sure you read the actual purpose of each shampoo, as you may not be selecting the right one for you. Also, this makes it easy to help narrow down your options. Most of us take price into consideration when buying a product, whether it’s a big purchase or something that costs only a couple dollars. It doesn’t necessarily mean we can’t spend the money, but it has to do with how comfortable we are in doing it. For example, you could have an endless supply of money, but you probably place value somewhere in products depending on how much they cost. Not only that, but if you’re not happy with a product and you spent more than you wanted, you’re going to have buyer’s remorse. We don’t want that! So, we recommend first setting a budget for yourself, and not going beyond that number. You’re probably also going to want to think about how your new argan oil shampoo smells. Everyone wants good-smelling hair, right? Not all argan oil shampoos actually smell like argan oil, believe it or not! Some smell more citrusy, some smell herbal, and some smell almost like nothing at all! Now that you know pretty much all there is to know about argan oil shampoos, which one have you decided on? 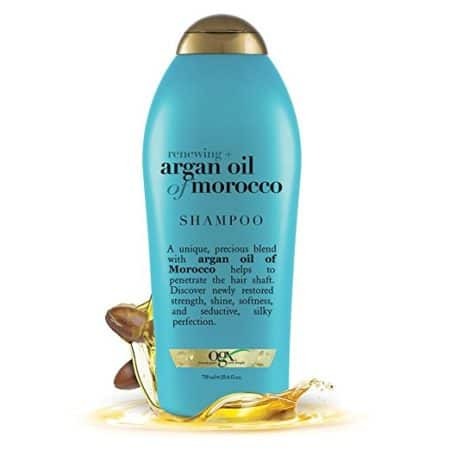 If you’re still on-the-fence about which one to select, then allow us to recommend again, the OGX Argan Oil Shampoo. First of all, it’s almost shockingly inexpensive. Not only is the price tag very low, but it lasts a very long time considering you only need a tiny bit to thoroughly cleanse your entire head of hair. In addition, the scent is mild and fresh, and the shampoo itself works to strengthen, cleanse, smooth, and soften the hair while simultaneously protecting it from potential environmental aggressors. So, which one of these best argan oil shampoos will be making its way into your shower?